Alan Philip Eric Knott (born 9 April 1946) is a former cricketer who represented England at international level in both Tests and One-Day Internationals (ODI). Knott is widely regarded as one of the most eccentric characters in cricket, and is also regarded as one of the greatest wicket-keepers to ever play the game. He was described by cricket journalist Simon Wilde as "a natural gloveman, beautifully economical in his movements and armed with tremendous powers of concentration". Born in Belvedere, Kent, Knott was educated at Northumberland Heath Secondary Modern School. Inspired by his father, Knott made his Kent debut in 1964 at the age of 18. He joined a long list of Kent-created wicket-keeper-batsmen. He gained his first Test cap at the age of 21, having been named Cricket Writers' Club Young Cricketer of the Year in 1965. He made his Test debut against Pakistan in 1967. Batting at number 8, he made a duck in his first Test, at Trent Bridge, but didn't concede a single bye in the match. He made 28 in the second match, but didn't make the starting eleven for the 1967–68 tour of the West Indies, as Jim Parks was initially preferred. However, for the fourth and fifth matches of the series, he was picked again. In the first of those, he made his first Test half-century, a score of 69 not out, and he once again excelled at wicket-keeping. In the fifth Test at Bourda in Georgetown, Knott produced what he regarded as the innings of his career. On the last day, with England needing only to draw the match in order to win the series, off-spinner Lance Gibbs took three quick wickets to have England teetering at 5 wickets down for 41 when Knott joined his captain Colin Cowdrey at the crease. The two of them combined for a 127-run stand and when Cowdrey was dismissed for 82, there was still over an hour for the West Indies to claim the four remaining wickets. By the final over, Knott was still in, but with him was the number 11 batsman Jeff Jones. Amidst the tension - which was too much for Cowdrey and Tom Graveney, who had gone and locked themselves in the toilets - Knott stayed calm and guided Jones through the final over to obtain the draw. 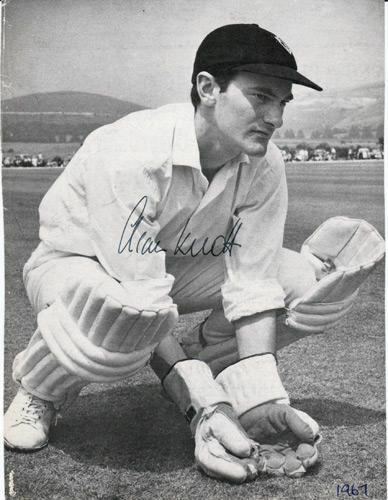 In the winter of 1968/69, again against Pakistan, Knott confirmed his position as England's premier wicketkeeper-batsman. He made two 50s in the series, including a score of 96 not out at Karachi when the match was prematurely ended by a pitch invasion by Pakistani fans, denying him a well-deserved hundred. I think he is the most gifted and dedicated cricketer one could ever wish to play with, never satisfied with his performance and always seeking for a little more perfection. 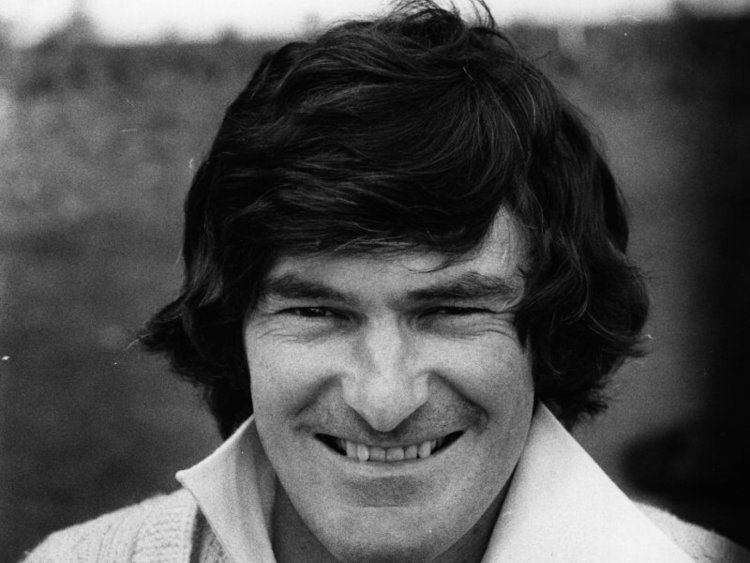 In the 1970–71 series in Australia he was instrumental in England regaining The Ashes, taking five catches and stumping Doug Walters in the decisive Seventh Test in Sydney. In the following series against New Zealand he finally made his maiden Test century, 110 at Auckland, having missed the first match of the series, so that Bob Taylor could take the gloves as a reward for patience as reserve keeper on the four-month combined tour. Knott did not miss a Test until 1977, making a sum of five centuries and twenty-eight 50s in that time. He has the distinction of once scoring 7 runs from a single delivery in Test cricket, off Vanburn Holder in the Fourth England v West Indies Test at Headingley in 1976. Knott took a quick single to extra-cover where Bernard Julien fielded and overthrew the wicket-keeper. Knott and Tony Greig ran two overthrows before Andy Roberts, fielding at square-leg, retrieved the ball and threw it past the stumps at the bowler's end and over the long-off boundary for four more runs. Knott helped England win the Ashes in England in 1977 but had been persuaded by England colleague Tony Greig to join Kerry Packer's World Series Cricket. This effectively put his England career on hold as the 'Packer players' were banned from Test cricket. When he returned to Tests after the end of World Series Cricket in 1980, he had very little success against a mighty West Indian side, averaging 5.14 in the series. He did not play in the tour of the West Indies that immediately followed, but was picked for the final two Tests of the famous 1981 Ashes series. Fittingly for one of England's greatest players, he ended his last Test against Australia at The Oval, with a score of 70 not out and an England series win. 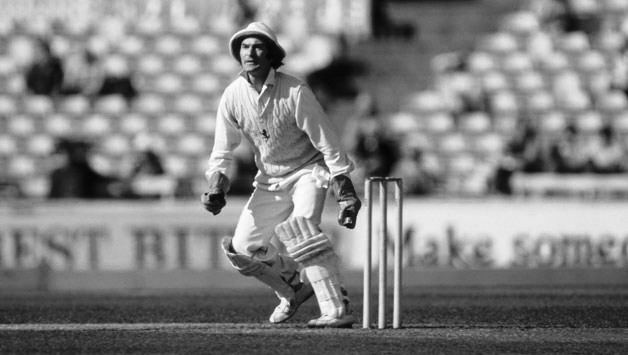 Knott's England career came to an end when he chose to take part in the first rebel tour to South Africa in 1981-82, in defiance of the sporting ban against the apartheid state. For this he and the other rebels were banned from international cricket for three years. After 22 seasons with Kent, Knott announced his retirement from cricket at the end of the 1985 County Championship season aged 39. He was still regarded as one of the finest wicketkeepers in the country, and his reasons for retirement included concern over an ankle injury as well as concentrating on his sports shop in Herne Bay, Kent and gymnasium business. Knott was known for his idiosyncratic behaviour on the field. 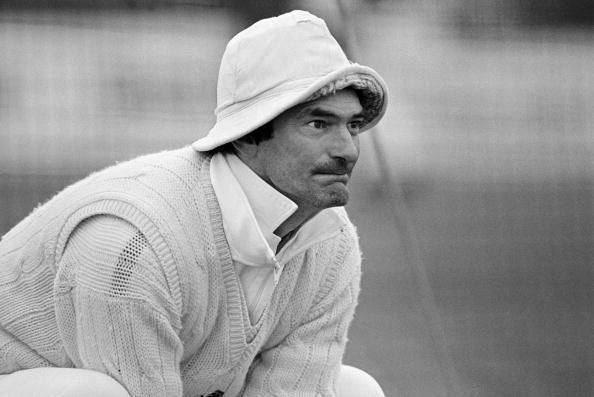 His trademarks included always keeping his shirt collar turned up to protect him from the sun; his sleeves rolled down to safeguard his elbows when diving; and, after a tip from former Northamptonshire and England wicket-keeper Keith Andrew, warming his hands with hot water before going on the field. According to Bob Taylor, Knott preferred strong-backed gloves with full webbing and plenty of padding in the palms, wearing two pairs of Chamois inners with strips of plasticine across the palms. After retiring, Knott was employed by the England management as a part-time wicketkeeping coach and assessor of Test cricketers. He would have taken up a specialist wicketkeeping coaching position, but it never materialized. In the early 2000s he and his wife moved to Paphos, Cyprus. In the October 2004 edition of The Wisden Cricketer magazine he was voted as the wicket-keeper in "England's Greatest post-war XI" receiving votes from 20 of the 25 panellists. In an article written in 2008, Daily Telegraph journalist Michael Henderson, comparing Knott with Adam Gilchrist, called Knott the greatest wicketkeeper-batsman, without argument, as opposed to Gilchrist, whom he called a batsman-wicketkeeper. On 6 September 2009, Alan Knott was inducted into the ICC Cricket Hall of Fame, and in 2013 he was named in Wisden's all-time Test World XI. His son James has also played first-class cricket for Surrey and Minor counties cricket for Cambridgeshire and Bedfordshire.